Indra Krishnamurthy Nooyi (born 28 October 1955) is an Indian American business executive and the current Chairperson and Chief Executive Officer of PepsiCo, the second largest food and beverage business in the world by net revenue. She has consistently ranked among the World’s 100 Most Powerful Women. In 2014, she was ranked at #13 on the list of Forbes World’s 100 most powerful women, and was ranked the 2nd most powerful woman on the Fortune list in 2016. Nooyi was born to a Tamil-speaking family in Madras (now known as Chennai), Tamil Nadu, India. She was educated at Holy Angels Anglo Indian Higher Secondary School in Madras. She received bachelor’s degrees in Physics, Chemistry and Mathematics from Madras Christian College of the University of Madras in 1974 and a Post Graduate Programme (MBA) from Indian Institute of Management Calcutta in 1976. Beginning her career in India, Nooyi held product manager positions at Johnson & Johnson and textile firm Mettur Beardsell. She was admitted to Yale School of Management in 1978 and earned a master’s degree in Public and Private Management. While at Yale, she completed her summer internship with Booz Allen Hamilton. Graduating in 1980, Nooyi joined the Boston Consulting Group (BCG), and then held strategy positions at Motorola and Asea Brown Boveri. Nooyi joined PepsiCo in 1994 and was named CFO in 2001. She was named President and CEO in 2006, replacing Steven Reinemund. Nooyi has directed the company’s global strategy for more than a decade and led PepsiCo’s restructuring, including the 1997 divestiture of its into Tricon, now known as Yum! Brands. Nooyi also took the lead in the acquisition of Tropicana in 1998, and the merger with Quaker Oats Company, which also brought Gatorade to Pepsi Co. In 2006 she became the fifth CEO in Pepsi Co’s 44-year history. She was named as the 3rd Most Powerful Woman in Business by Fortune in 2014. Since she started as CFO in 2001, the company’s annual net profit has risen from $2.7 billion to $6.5 billion. Nooyi was named on Wall Street Journal‘s list of 50 women to watch in 2007 and 2008, and was listed among Time‘s 100 Most Influential People in The World in 2007 and 2008. Forbes named her the #3 most powerful woman in 2008. In 2014, she was ranked #13 by Forbes.Fortune ranked her the #1 most powerful woman in business in 2009 and 2010. On 7 October 2010 Fortune magazine ranked her the 6th most powerful woman in the world. In Fortune‘s Most Powerful Women List of September 15, 2015, Nooyi ranked 2nd. 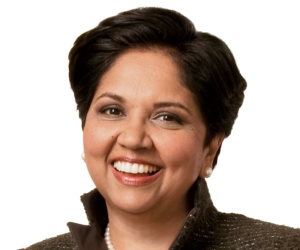 Nooyi’s strategic redirection of Pepsico has been largely successful. She reclassified Pepsicos products into three categories: fun for you (such as potato chips and regular soda), better for you (diet or low-fat versions of snacks and sodas), and good for you (items such as oatmeal). Her initiative was backed up with ample funding. She moved corporate spending away from junk foods and into the healthier alternatives, with the aim of improving the healthiness of even the fun offerings. In 2015, Nooyi removed aspartame from Diet Pepsi, furthering the shift towards healthier foods. While CEO of PepsiCo in 2011, Nooyi earned $17 million, which included a base salary of $1.9 million, a cash bonus of $2.5 million, pension value and deferred remuneration of $3 million. By 2014, her total remuneration had grown to $19,087,832, including $5.5 million of equity. Forbes magazine ranked Nooyi on the 2008, 2009, 2010, 2011, 2012, 2013, and 2014 lists of The World’s 100 Most Powerful Women.Fortune magazine has named Nooyi number one on its annual ranking of Most Powerful Women in business for 2006, 2007, 2008, 2009 and 2010. In 2008, Nooyi was named one of America’s Best Leaders by U.S. News & World Report. In 2008, she was elected to the Fellowship of the American Academy of Arts and Sciences. In January 2008, Nooyi was elected chairwoman of the U.S.-India Business Council (USIBC). Nooyi leads USIBC’s Board of Directors, an assembly of more than 60 senior executives representing a cross-section of American industry. In 2009, Nooyi was considered one of “The TopGun CEOs” by Brendan Wood International, an advisory agency. After five years on top, PepsiCo’s Indian American chairman and CEO Indra Nooyi has been pushed to the second spot as most powerful woman in US business by Kraft’s CEO, Irene Rosenfeld. In 2013, Nooyi was named one of the “25 Greatest Global Living Legends” by NDTV. On December 14, 2013 she was awarded by the President of India Pranab Mukherjee at the Rashtrapati Bhavan. Nooyi was named to Institutional Investor‘s Best CEOs list in the All-America Executive Team Survey in 2008 to 2011. The prestigious Yale School of Management will name its deanship in honour of PepsiCo’s India-born CEO Indra Nooyi as she gifted an undisclosed amount, becoming the school’s biggest alumni donor and the first woman to endow a deanship at a top business school. Nooyi is a Successor Fellow of the Yale Corporation. She serves as a member of the Foundation Board of the World Economic Forum, International Rescue Committee, Catalyst and the Lincoln Center for the Performing Arts. She is also a member of the Board of Trustees of Eisenhower Fellowships, and has served as Chairperson of the U.S.-India Business Council. Nooyi serves as an Honorary Co-Chair for the World Justice Project. The World Justice Project works to lead a global, multidisciplinary effort to strengthen the Rule of Law for the development of communities of opportunity and equity. In December 2016, Nooyi joined a business forum assembled by President-Elect Trump to provide strategic and policy advice on economic issues. Nooyi has two daughters and resides in Greenwich, Connecticut. One of her daughters is currently attending the School of Management at Yale, Nooyi’s alma mater. Forbes ranked her at the 3rd spot among ‘World’s Powerful Moms’ list. Indra Nooyi is now looking to forge a career in politics. Her older sister is singer Chandrika Krishnamurthy Tandon.